*What a wonderful day of spending time with people I love. *The day began going and getting some coffee for breakfast, and visiting with Laurie. When I returned I talked to my friend April in Italy for about an hour. It is so nice to have our weekly conversations. She was very excited because she had another woman sign up for her retreat at the end of May. *Around 11 a.m. my friends April and Mary arrived to ooh and aah over Laurie’s new house, and take me to brunch. We went to Le Peep on Eagle Road. There is a Le Peep in Coeur d’Alene that I really like eating at, so I thought we should give this one a try. It was delicious as well. April, Mary and I got caught up our lives, and the lives of our kids, and it was so nice to spend time with these two wonderful women. *They brought me back to Laurie’s house, and Zoe soon arrived. She drove me out to Boise to my cousin Judy’s house. Judy had a box of dishes she wanted to give me, so we arrived, and enjoyed out time visiting with her and Jack and meeting their cute little poodle Rosie. *After time with my cousin, Zoe and I arrived at the Jahner house to visit my friend Anita. What a fun time of laughs and British television recommendations. And, as a special treat, her two sons Evan and Max were there, and I got to see them and visit and give them a big hug!! 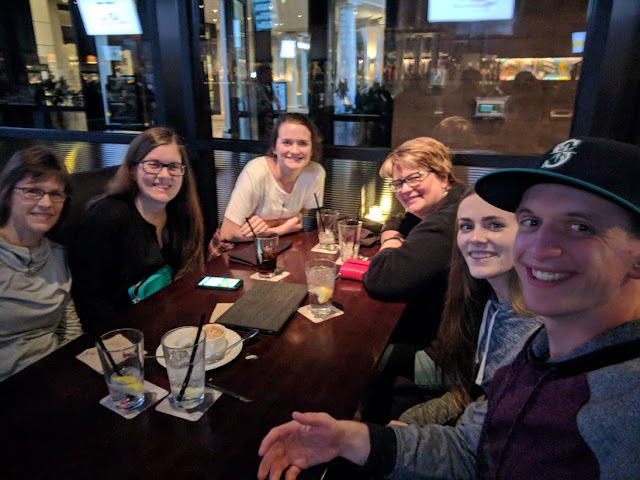 *The whirlwind tour continued as Zoe drove us out to The Village in Meridian so we could meet Linda, Karlie, Daniel and Laurie for dinner at The Yard House. Again, lots of love and laughs shared around the table. *Zoe and I ended the evening at Laurie’s house, talking about podcasts. I hugged Zoe and told her goodbye, and headed to bed.